Who says you can't throw back on a Tuesday?! You will notice that a lot of our work is done outdoors, which can definitely be easier. Not just in terms of lighting, but often times when you are outside you can find areas that are more private, or away from people. Doing a photography session indoors can definitely be a little more intimidating for some couples, and they tend to get a bit more shy and very aware of their surroundings. It can be harder to get into the zone and just focus on your partner and have a good time. This is why when we are talking about indoor locations, we always try to find a place that is familiar, where the couple can truly be themselves and get lost in each other. This allows the moments to just flow, one after the other. A while back, this is exactly what we did with Rhiannon and Brian. 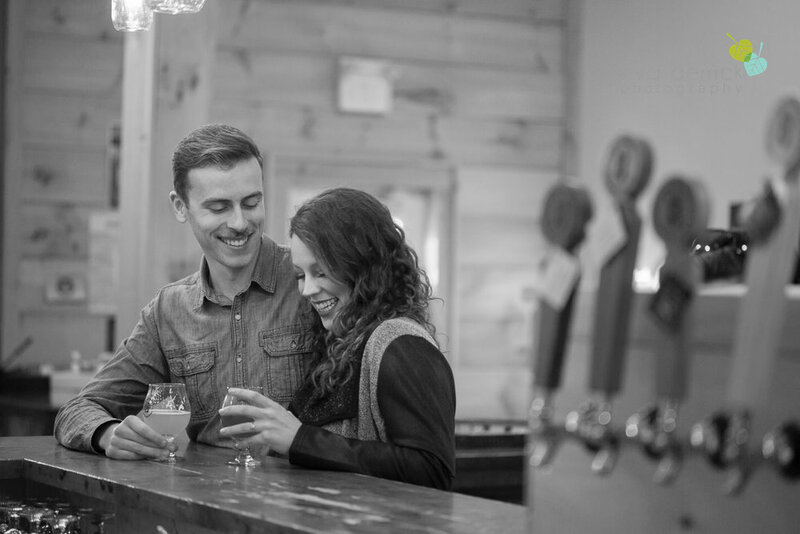 They love going to Block Three Brewery, so it seemed fitting that we go there for their engagement session. Thankfully, the people at Block Three are super accommodating, and so are all their patrons. I urge people whenever you need to photograph indoors, definitely be a little more creative in your thinking process. Sometimes, you might worry that places require a permit (and that might not be something you are interested in investing in), but if it is a place you love, or you frequent, chances are they may just say yes. It never hurts to ask. And most photographers would love to provide the establishment with some photographs to use for their marketing or social media as a trade. Open a dialogue with them, and see what happens. We hope you enjoy this throw back, as much as we did while photographing it! Click here to contact us for details.